This is the continuing story of sisterly love in the second half of our lives. The adventure began when my older sister, Melanie, and I, ended up living near each other in Texas. I have been married for 36 years and have raised two children. I was also the full-time caregiver for both my parents who lived with us. My husband’s a retired Marine pilot and in his second career as a pilot he is gone for two weeks out of the month. Because of this and Melanie’ s retirement we had a lot of spare time on our hands. This is when we began our adventures together with our horses. 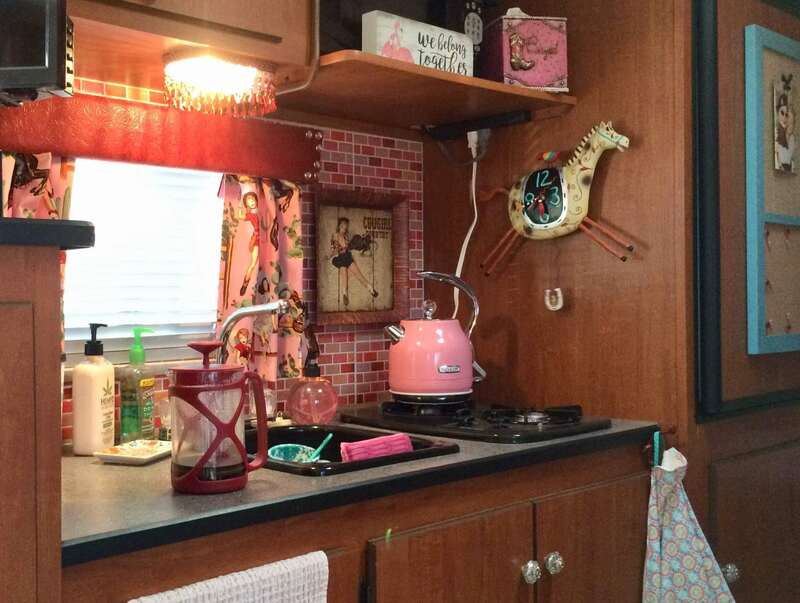 In addition to that, Melanie’s long-term desire to own a small trailer became reality. As Melanie said in her story, our creative minds began to work. One day I was looking on Facebook’s Buy Sell and Trade site and up popped a 2011, 19 ft., Sportsman Classic trailer. It was exactly what I was looking for and the price was right. We went out to look at it and brought it home that night. “Classy Cowgirl” had to be her name. She had a very neutral pallet. 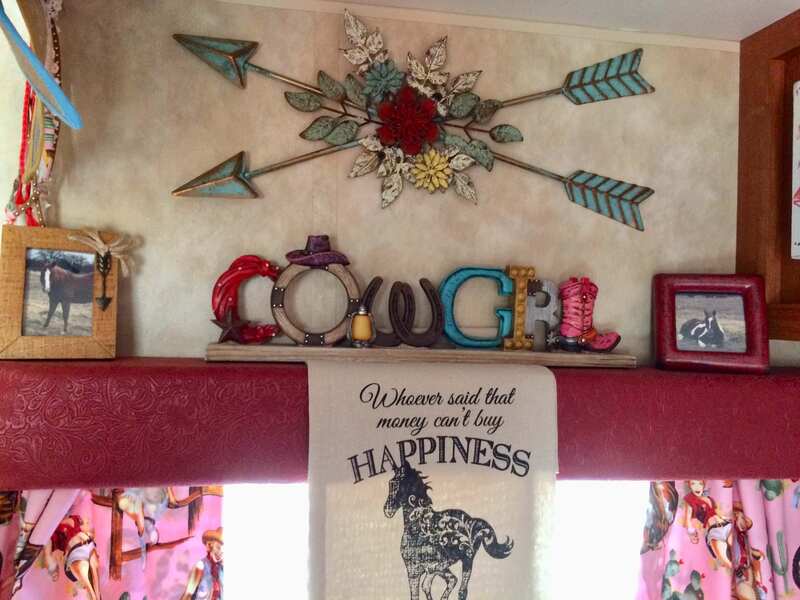 Once again, the décor all started with a quilt that I found on E-bay. I recovered the olive-green cushions with a bright turquoise and red faux leather. 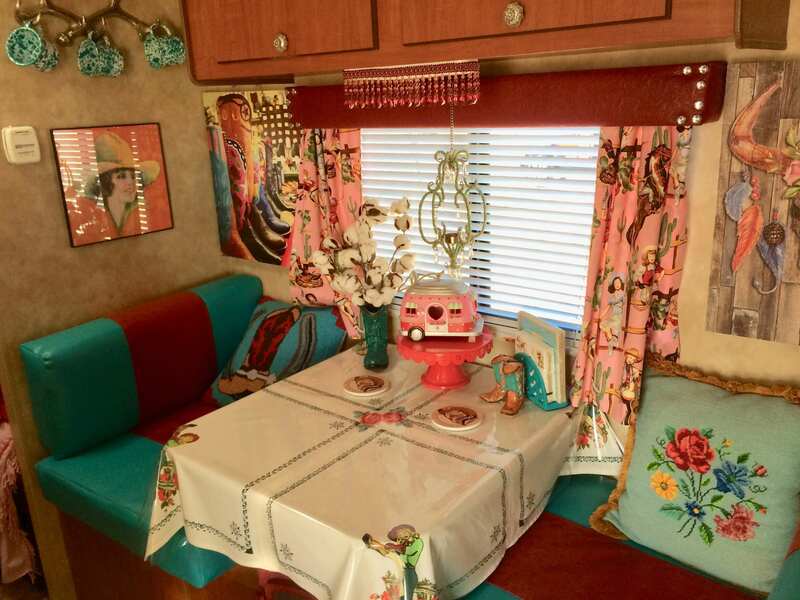 I purchased and made the curtains out of a darling, pink cowgirl fabric. I also recovered red faux leather cornices with bling studs in each corner. The backsplash is full of coordinating colors that match the décor perfectly. I also bought a cowgirl table cloth and matching shower curtain. I brought it all together with a plethora of pillows all over the bed. One of my favorite features, is a red fireplace-heater that I built into the corner of the full-size bed. 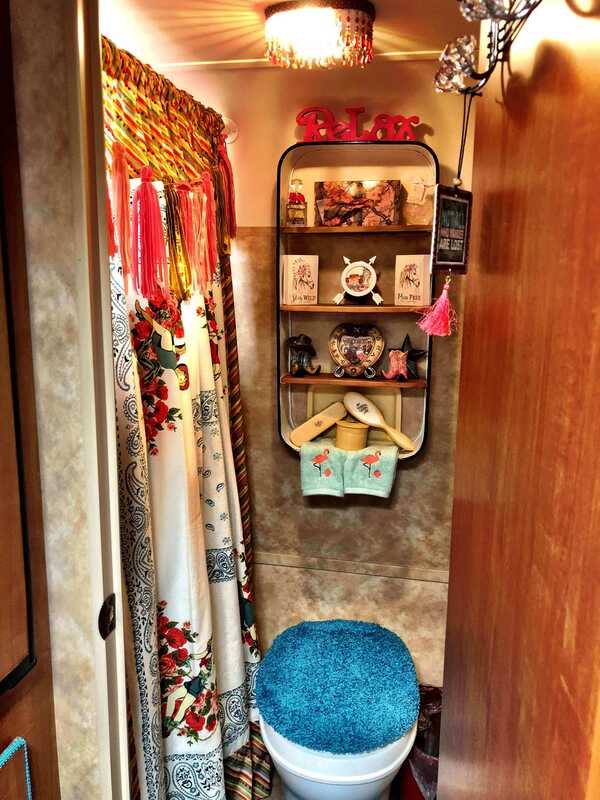 “Classy Cowgirl” has two bunk beds, one is used for storage and the other is Melanie’s bed which she calls her “bullet bed.” The modern facilities include a real flushing toilet, tub, shower, and a sewer hook- up with holding tanks. The outside was another story. It was covered with many vinyl stickers that had to come off a.s.a.p. This was a real job which took a hot blow dryer and lots of peeling. 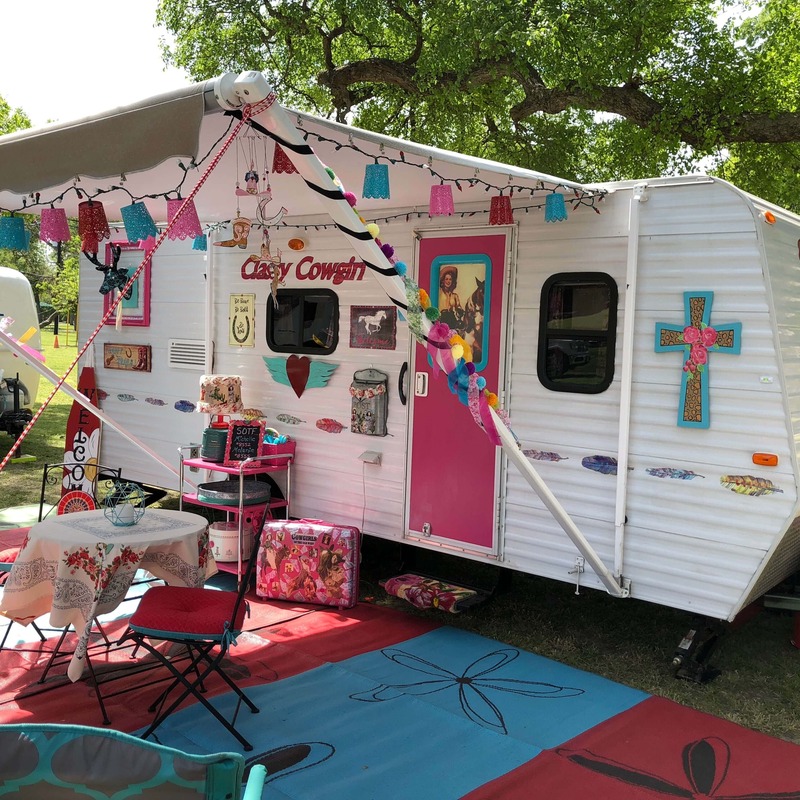 Once I got that done, I added the perfect vinyl stickers with her name “Classy Cowgirl.” I used command strip hooks to add removable cowgirl décor that we use when we are parked. Melanie and I have been part of this exciting glamping adventure for one year now and it has been so fulfilling, fun, and rewarding. 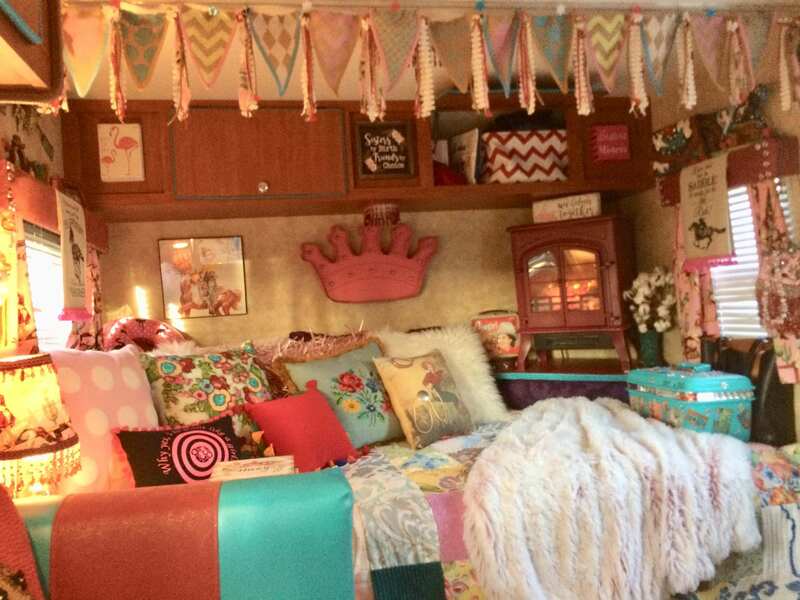 I challenge you, the readers, to find the courage to investigate this awesome glamping life-style for yourselves. You won’t be sorry! It will bring you to higher ground. Happy Trails!! !